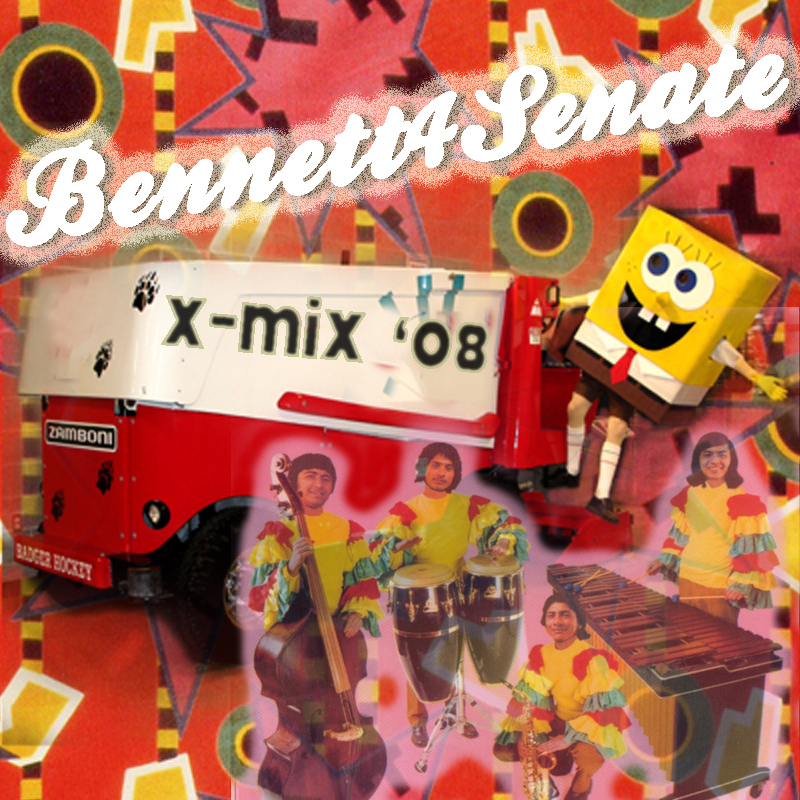 Bennett4$enate – XMIX 2008 | F.A.T. The short answer is that this year I listened to a lot of disco. In January ’08, shortly after publishing last year’s XMIXes and with the housing bubble still comfortably inflated, I linked up with like-minded WNYU DJs for the inaugural Serious Bu$iness, a night of electric disco and boogie funk. Still going strong at the ripe age of 1, Mike and Alex put me up on a lot of disco 12″ knowledge in 2008, and with the help of Jamie Dubs we established some Serious Bu$iness classic party starters including the D Train and Central Line included here. 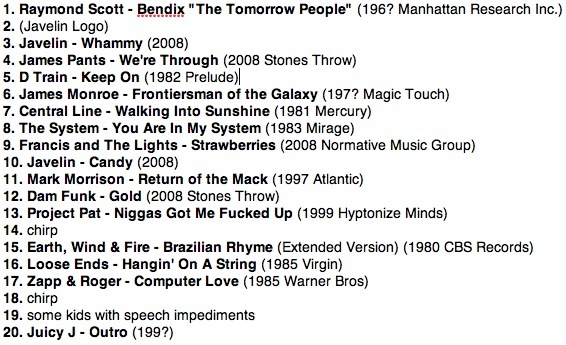 Luckily we weren’t the only ones feeling the pulse of synths and boogie rhythms (and motherfucking so much autotune) last year – proud to say that my XMIX has a number of tracks that actually came out in 2008! James Pants and Dam-Funk are two of the most exciting recently signees to Stones Throw, and James’ Welcome LP and Dam’s Rhythm Trax Vol. 4 have been on steady rotation at the house. I also had the chance to share a drink and talk music with the both of them during CMJ, and they are two kind, motivated, enthusiastic dudes. Good people. No surprise – we’re all Gemini’s (me’n James got the same birthday). A few discoveries came from the catalogs of a certain record label at which I was briefly employed this year that shall remain nameless. They have some deep gems in the catalog (which, thankfully, is completely digitized) that will remain painfully overlooked as long as they have the same boss problems that made me jump ship. The James Monroe cut being a prime example, as well as the lost bit of tape that’s on some after-school program spittle, reminiscent of my man Eli’s famo-worthy battle. With my “cheesy music” gag reflex seriously tamed by a steady diet of disco, (and a friendly push from my girlfriend) the floodgates were opened to let some seriously R&B-flavored jams find their way into my crates and my heart, from Computer Love, Loose Ends, and the crafty productions of the System, up to the ‘too soon?’ nostalgia of a Mark Morrison banger. Raymond Scott and Project Pat, scientists in their own worlds, got me through my last semester of college, and Javelin will be forever fresh. Stay tuned to letsgetserious.net for more musical selections in 2009! A Downtown Affair – Mike McGill and Alex B. doin’ the disco from WNYU to you. My guest set here. Discogs, Wax Poetics, drop.io, Last.fm, Opentape, and Oh Babar! for being great resources. fixed it – thank you helpful readers. enjoy the music. YO you got that spanish language version of you are in my system? nah I need dat – you got? that bilingual dub version is in Spankie Hazard’s ‘Feel It’ mix. Estas en mi systema! d/ling now, lookin’ forward to this!